The first part of this quest that we are going to start at will give us Life Lichen and is called Seasons of the Mind - Life Lichen is a first aid stim which will give you health. NOTE: if you open your mission tab (CTRL 4) you will also see that the Yuttos has given you a waypoint to start your garden key quest... but that is for another guide! 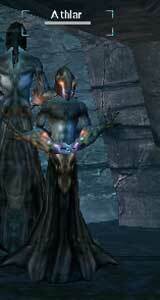 Our task is to kill 4 Fissure Hiathlins as well as a named Hiathlin named Ossuz. To find them, head slightly west of the Yuttos camp towards a large dark looking machine / building. 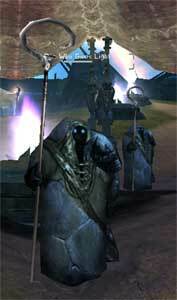 The Fissure Hiathlins appear to be approximately level 70 mobs and Ossuz, level 80. Ossuz is at approximately 500 x 1500. As you kill each Hiathlin, you will get an update message on your screen telling you how many more you need to kill. For killing all the Hiathlins, you will receive 10k Credits in addition to 10k for killing Ossuz. When you have killed all the Hiathlins and the boss, a Essence of Summers Lost will spawn in your inventory. Now it is time to revisit One who Gives Light. Tell Yuttos that you have found some memories, trade him the item - and there you go! Mission Accomplished! A stack of 5 Life Lichen will be placed in your inventory by the yuttos. Note: Final completion of this quest yields no credits or XP reward. For the Notum Slug Quest, more Hiathlins will have to be killed - so lets go back to the west of the Yuttos Camp. The quest will ask you to kill 4 Hiathlins and Athlar. 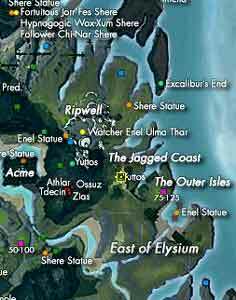 Athlar is located at the same site as Ossuz was, 500 x 1500. Again, you should receive 10k Credits upon killing the 4 Hiathlins and another 10k for killing Athlar. When you have killed them all, you should find an Essence of Winters Past in your inventory. Back to One Who Gives Light again... Tell him you have found some memories, trade with him and you will receive a stack of 5 Notum Slugs. Our final task will be to gain a Power Bug. This time our targets to kill are Drowsy Arcorash's. The mobs are also found west of the Yuttos Camp and are approximately level 65-80. The Boss, Tdecin, is approximately level 85. You should find Essence of Autumns Drowned in your inventory. Now time to revisit One Who Gives Light again. Tell him you found the memories, trade with him and for completing his task you should gain a stack of 5 Power Bugs. There is an option to ask him about access to your faction's garden in this zone. 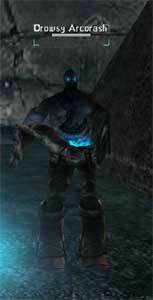 He will then provide you with a simple mission to talk to the NPC that will get you started on the garden key quest. It will also contain waypoint data, very useful to actually find those sneaky sided mobs! 1. It appears that these quests can be repeated as many times as you wish as long as you remain in level range of the quest. 2. The mobs you have to kill to complete this often drop pattern pieces which can fetch a reasonable amount of small change for new players.